It’s been almost a year since local legend Mark Larson returned to AM 760 where he began his talk show career. Each week, his voice is heard on a variety of programs and commercials via more than 2,000 radio stations, podcasts and TV outlets worldwide. Mark Larson’s Southern California talk show airs on AM KFMB weekdays from 10 a.m. to noon. He often appears on Fox News Channel and serves as a news analyst and commentator on KUSI in San Diego. Known for travelling the world to gain insight on important stories, he’s covered the Iraq War on location and done groundbreaking broadcasts from war zones, including the Persian Gulf and Afghanistan. At home, he is a generous community booster, for example serving his fifth term as chairman of the board of directors for the San Diego Air and Space Museum. On Tuesday, May 8, Larson will highlight the Navajo Canyon Republican Women Federated (NCRWF) luncheon meeting at The Brigantine in La Mesa. Check-in begins at 10:30 a.m. for the 11 a.m. meeting. Lunch is served at noon followed by our program. Cost of the luncheon is $25 and reservations are required. RSVP at ncrwf99@gmail.com (use “luncheon” in subject line) or call 619-990-2791. We all enjoy Larson’s lively humor that informs and entertains San Diegans and we hope you will join us. We are proud that two of our NCRWF members were honored recently as recipients of awards given out at the Lincoln Reagan Dinner 2018 event. Our president, Kat Culkin, received the Louisa Akins – Woman of the Year award. It is based on her many years’ efforts on behalf of Republican causes. This is significant because the Louisa Akins award was named after one of our deceased members and mother of long-time member Carol Reed. Ruth Weiss is another of our members who works tirelessly leading the Election Integrity Project. Many of our members are volunteers with EIP, trying to keep elections honest. 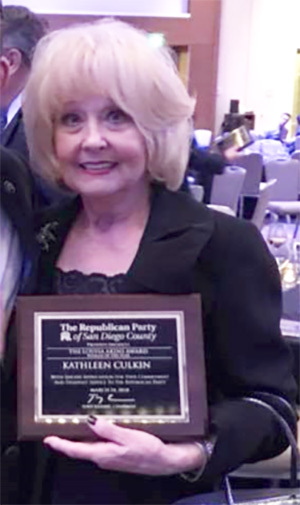 Her leadership was honored as the Republican Party’s Coalition Partner of the Year. These two women inspire us all. Our April “Make San Diego County Greater” event once again drew a huge crowd! Featuring KFMB radio personality Mike Slater, a silent auction and several candidates running in the June 5 primary election, the evening was lively indeed. Among candidates speaking at our ‘Candidate Express’ were David Hernandez, Lt. Governor; Larry Wilske, 71st Assembly; John Moore, 79th Assembly; Juan Hildalgo, 51st Congressional; John Horst, 52nd Congressional; Dr. James Veltmeyer, 52nd Congressional; Brett Golda, 53rd Congressional; Morgan Murtaugh, 53rd Congressional; Bonnie Dumanis, Board of Supervisors; Vickie Rothman, Superior Court Judge; Judge Robert Amador, Superior Court (unopposed); Judge Herb Exarhos, Superior Court Seat 28; Mark Arapostathis, La Mesa Mayor; Bill Baber, La Mesa City Council; Guy McWhirter, La Mesa City Council; and Andrew Hays, Lakeside School Board. That’s quite a slate of speakers and a lot of time for interesting political conversations. The evening was capped off with an amazing PowerPoint presentation of all the promises kept by President Trump: 2.4 million new jobs, unemployment at 45-year low, tax cuts, bonuses to workers, fewer Americans on food stamps, approval of more generic drugs, extinguishing most of the Islamic State group’s territory, and keeping Guantanamo open among many other things. The last day to register for the June 5 primary is May 21. On April 18, NCRWF will take the lead at the New Citizen Ceremonies for voter registration downtown at Golden Hall. Voter registration is important to our new citizens and we want to welcome them to the Republican Party. They’ll be able to vote in the primary! For more information on our plans and programs, visit us at navajocanyonrwf.org and check us out on Facebook. 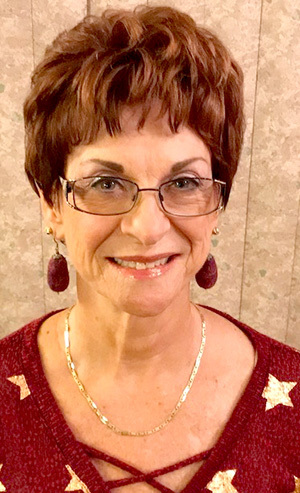 — Judy McCarty is publicity chair for the Navajo Canyon Republican Women, Federated. Reach her at jhmccarty@cox.net.